This is a fairly regular meal around our house. It’s quick, it’s easy, and it’s so yummy! In a large saucepan simmer the coconut milk with the curry paste over medium heat for about 5 minutes. Add the fish sauce, brown sugar, and broth. Then add whatever vegetables and protein you want to add. Make sure you don’t over cook the veggies. I put the carrots and broccoli stalks in first, and when they are almost done I throw in the broccoli florets. Add the tofu when everything is just about done. I serve this over brown rice. YUM! 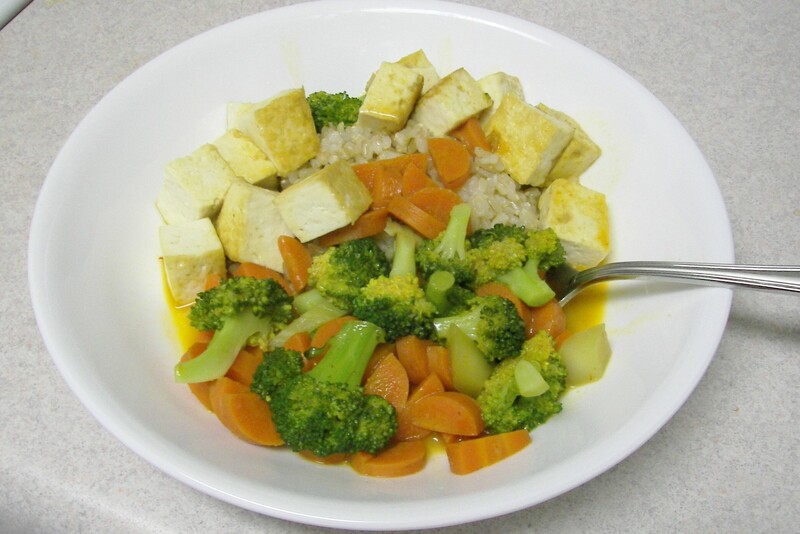 I love coconut curry, it is always yummy and so easy to make. I like mine with tofu, broccoli, carrots, and bell peppers. You can choose what vegetables you like, and it’s good with chicken too. In a large saucepan simmer the coconut milk with the curry paste over medium heat for about 5 minutes. Add the fish sauce, brown sugar, and broth. Then add whatever vegetables and protein you want to add. Make sure you don’t over cook the veggies. I put the carrots and broccoli stalks in first, and when they are almost done I throw in the broccoli florets. If you are using chicken, put that in first, when it is almost done, then toss in the veggies. If you use tofu just put that in at the same time as the veggies.